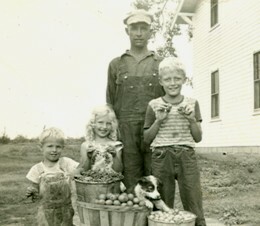 In the spring of 1944, when Bill and Meta Juhnke moved eighteen miles from the town of Buhler in Reno County to their farm near Elyria in McPherson county, they became full time family farmers. The farm had been their base ever since their marriage in June 1937. But they had not had either enough land or requisite farm machinery for a full-time farming operation. They had depended upon their parents and others for farm machinery and farm labor. Each June and into July their ripened wheat stood unharvested in the field south of the farm home until the Jonas Goerings (Meta's family) or the Ernest Juhnkes (Bill's family) had completed their wheat harvest and could bring their combines to harvest Bill and Meta's wheat. Because they had been absent from the farm at key points, Bill and Meta had not accumulated the full complement of livestock--cows, pigs, and chickens--that were standard for family farming in those years. In the summers of 1938, 1939 and 1940 they had moved to Lawrence where Bill took classes for a master's degree. Then in the fall of 1942 they had moved to Buhler and lived in rented houses for two years while Bill taught history and social studies in Buhler high school. For at least part of that time, they rented the farm home near Elyria to a young family. That rental arrangement was not satisfactory. The renters were not highly motivated to keep the house in good condition. They raised small chickens in an upstairs room. When they left, the renters unscrewed and took along the light bulbs. Bill and Meta moved as fast as they could in the spring of 1944 to expand their farm operation--both land and livestock. With Bill no longer receiving a teacher's pay check, they needed to produce farm products for income. But there was an additional motive for expanding the farm operation. World War II was still raging in Europe and the Pacific. Bill wanted to avoid being called in the military draft. Farmers were less likely to be called than teachers, and larger farm operations increased the chances of exemption. Ernest Juhnke, Bill's father, allowed Bill to rent land in the Elyria area. Bill also went to his uncle, Simon Stucky (married to Ernest's sister, Ida) and begged him for the opportunity to rent some land. Uncle Simon responded to Bill's situation and allowed him to rent a field in the section to the north of Bill and Meta's farmstead. With what he owned and was able to rent, Bill farmed a little over two hundred acres of land. As it turned out, Bill was not drafted. He never knew, of course, whether his decision to leave teaching and undertake full time farming helped him avoid the draft. He did know that the war resulted in good prices for farm products. The most important implement for the small farm was a tractor. Early in the war, probably sometime in 1942, Bill had bought a new Farmall "H," made by International Harvester. The "H" had steel lugs rather than rubber tires because of wartime rubber rationing. The tractor lugs made deep indentations in the asphalt pavement of highway #81 that Bill had to cross to get to the south field across the Missouri Pacific railroad tracks. The "H" had a four-cylinder engine with five forward gears. It pulled a two-share plow--a great leap forward for anyone accustomed to plowing with horses. It had a pulley mechanism with belt that Bill hooked to a large saw for cutting tree limbs and wood to heat the house in the winter. 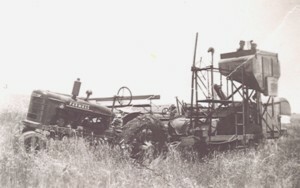 Bill had Milford Waltner, a mechanic in Elyria who was married to Meta's cousin, build a hydraulic front-loader lift for the "H." The lift had one front scoop attachment for moving dirt and manure, and another larger and unwieldy attachment for carrying loads of prairie hay and alfalfa from the fields to the barn. In subsequent years the "H" was replaced for heavy pulling by larger and stronger tractors-Allis Chalmers ("C" and "WD") and John Deere (3010 diesel). But the "H" survived the years, with the help of Bill's numerous overhauls. It finally got a good price as an antique at the Juhnke farm auction half a century after it had been purchased. For other farm equipment, Bill saved money by buying used implements, some of which had been built for horsepower. He acquired a mower for cutting hay and grass, and a two-section drill for sowing wheat. Both the mower and the drill originally had had long tongues for pulling by horses. Bill cut the tongues of these implements short and fixed them to be attached to the pull bar of the "H." He also bought a used plow, a used harrow, and a used "springtooth" cultivator. In about 1948, when he bought a used wheat combine from Daniel "Bubber" Goering, he was able to harvest his wheat crop as soon as it was ripe, rather than being dependent on his wider family. Wheat was by far the most profitable crop in Kansas, although Bill experimented with smaller plantings of oats, corn, milo, and other green forage crops. 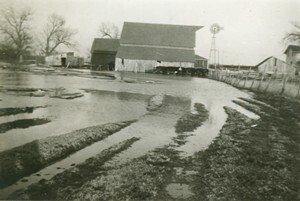 One small ten-acre field ("behind the tracks") was still unbroken prairie grass, which, in a good year, produced two crops of hay for feeding the cattle over the winter. In the 1940s the crop of alfalfa became popular, both because it was more nutritious for animals and because it could produce three or four crops per year--depending on adequate rainfall. So Bill plowed up the remaining prairie and planted it to alfalfa. Unlike many farmers in the area, Bill did not build a silo to store chopped green crops ("ensilage") for feeding livestock. He preferred hay and alfalfa. The grass on the pasture land that bordered the Dry Turkey Creek on the Juhnke farm was generally sufficient for about twenty cows, and one or two horses, to graze through the summer. There were a few beef cattle, but mostly non-purebred milk cows. Bill gradually increased his herd of milk-producing cows to a peak of about twelve. The labor of milking by hand was the major constraint. Bill and Meta did the milking in the mornings; Jim helped in the evenings from the time that he started, aged eight or nine. In about 1947 or 1948 Bill and Meta bought a DeLaval milking machine from the Elyria Lumber and Mercantile Store. The machine traumatized the cows for the first several weeks of use. The milk went into buckets (not a bulk tank), and the milkers carried it to a separate milk house for separating the cream. The skim milk was fed to the calves and pigs. The cream went into five-gallon cans for weekly pickup by the Moundridge Creamery. Meta made a lot of cottage cheese and cream-rich pastries for the family. Bill and Meta raised chickens for meat and for eggs. In the early years they used some laying hens to incubate and hatch the eggs, a method that was both inexpensive and inefficient. Soon they began purchasing small flocks (fifty or so) of day-old chicks and feeding them in a small "chicken house" on the southwest side of the farmstead. After a certain age, the chickens were given the run of the farmyard--except for the garden and the small lawn in front of the house. The prospective laying hens had a chance for a decent existence. The family ate a lot of eggs, and took the extras to Jonas Stucky's store (another cousin) in McPherson for sale on the weekly trip to the city. But the roosters were doomed. Meta supervised the butchering. She taught her children how to hold the young mature birds over a wood stump, chop off their heads with a corn knife, hold them down while the blood spurted out, plunge them into a bucket of very hot water, pull off their feathers, and remove their innards-saving the heart, liver, and gizzard. Chicken meat was a delicacy often served to family and guests for the Sunday noon meal. Bill and Meta also raised hogs, with three or four porkers usually in the pen being fattened for butchering. The hogs grew up on skim milk, kitchen slops, and "mash" made up of ground oats or corn. Hog butchering day, often in late fall, was great social occasion. Grandparents, aunts, uncles and families came for the event. Everyone seemed to have assigned roles. Bill supervised the killing and scalding of the hogs, and cut them open. Meta prepared the meat cutting table, and fixed the noon meal, including delicious tenderloin and a famous dish of liver, onions and brains. Grandma Alvina Juhnke scraped and cleaned the small intestines to be used for sausage casings. One of the uncles, such as Carl Juhnke or Reuben Krehbiel, cut up the pigs' heads. The children kept the fire hot for the cauldron that boiled the meat for liver sausage, pork sausage, and, finally, boiled down the fat into lard. When they began farming, Bill and Meta had a mechanical cream separator that needed to be turned by hand. Jim remembers one time when he, probably too young for the job, was assigned to turn the separator handle and managed to tip over the mechanism and spill the milk onto the floor. It was a major advance when Bill and Meta bought an electricity powered cream separator, but it was still a lot of work both morning and evening to assemble and disassemble the separator parts and to wash them in hot water. Meta's initial equipment for washing clothes was primitive by modern standards. She had a washtub for washing the clothes, with a double-roller mechanism fixed to one corner for squeezing out the soapy water. Then the clothes were rinsed in another tub of clear water, and once again squeezed through the rollers. One had to be careful to insert the clothes into the rollers at a manageable pace, and not to get one's hand into the rollers. That was a two-person job. Jim remembers getting his hands in the wringer more than once, and having his mother free him with the release mechanism. Eventually Meta got a more modern washing machine, but she always hung the clothes out to dry on the clothesline south and east of the house. It was an important day when the rickety old wooden clothesline frames and loose lines were replaced by metal pipe frames with cement foundations. The Juhnke house was old (built about 1925) and drafty. It was heated with a whole house wood stove in the basement. In winter time Bill and Meta closed the stove vents so that the large kitchen was the only room heated in the house--except for the bathroom for Saturday evening baths. Perhaps the most important home improvement project was a set of built-in cabinets and new sink on the south wall of the kitchen. Henry J. Goering, Meta's uncle who lived in Elyria, was a carpenter who put in the new cabinets. Other important additions included an electric refrigerator and a new piano. Living on the farm full time, Bill and Meta were able to expand the size of their garden south of the house. (See an outline of the farmstead in Chapter 1.) Potatoes were the garden crop that produced the most food for the table, but the garden also included radish, carrots, lettuce, green beans, beets and poppy. There were also cucumbers and cabbage-for making pickles and sauerkraut. Later in life, Meta reminisced with some amazement about her diligence: "And the garden. . . . I canned beans. Forty quarts. Horrors!!" When they tore down the shed just north of the entrance to the farmstead, Bill and Meta planted potatoes on that site as well. The soil there was especially fertile because the shed had been used many years as a pig lot. They planted corn-both sweet corn and popcorn--at "the other place"--a mile east and a mile and a quarter north of the farmstead, where Uncle Wesley Juhnke had lived before selling that place to his brother, Ernest Juhnke. Eventually Bill and Meta expanded their home garden southward and added fruit trees-sour cherry, peach, apricot, apple and pear. The cherry trees seemed to be most successful. The planting, cultivating, harvesting and preserving of garden products were labor intensive. The weather in Kansas was not reliable. A spring drought and early summer heat could drastically reduce garden production. to collect wild grapes, walnuts, and sand-hill plums. Summer 1947. Meta's household was a model of frugality. She reused and recycled everything, including wax paper from cereal boxes and plastic wrap from bought bread. She used fat drippings to make lye soap. She mended and patched clothes, and then made them over for younger children. Threadbare clothes eventually wound up as rags for cleaning or for fashioning into rag rugs. Flour sacks became tea towels. Leftover material from sewing dresses found its way into quilts. Meta and Bill had two more children on the farm and one more was on the way when they moved to Lehigh in the fall of 1950. William Ernest, Jr. was born January 26, 1945. That was a difficult breech birth. Meta said she could feel her uterus tear: "It felt like a hot knife slicing." She approached her subsequent pregnancies with trepidation, but they all went quite well. Sharon Kay was born July 13, 1948--the same birthday as her Grandma Alvina Juhnke. Ruth Elinor Juhnke was born in the McPherson hospital on Christmas Eve, December 24, in 1950. These births were part of a wider family population explosion. In the six years between Buhler and Lehigh--1944 to 1950--Bill and Meta and their siblings produced twenty-one children. The population explosion continued apace in subsequent years. Over the decades, however, the size of families decreased markedly on a clear generational pattern. The grandparents (Ernest and Alvina Juhnke, Jonas and Katie Goering) had had eleven and twelve children. The parents (Bill and Meta's generation) generally had five or six children. These children in turn generally produced only two or three children. This pattern corresponded the wider world's declining birth rates in the transition from rural to urban, traditional to modern, and agricultural to industrial ways of life. Meta loved her role as mother, gardener, and homemaker. She said she did not find her situation confining. She never was tempted to look for a wage-earning job outside of the home. Delbert Preheim, her brother-in-law, wrote in one letter with apparent amused disbelief that Meta "speaks of staying home with the kids as if it were the acme of contentment--a sort of nirvana one attains to." Delbert, no doubt, was thinking about all those dirty cloth diapers, snotty-nosed and illness-prone kids, and unending chores of house-cleaning, meal preparation, farmyard work, and gardening. Bill loved farming in those years, but he also missed the classroom. After two years of full-time farming, 1944 to 1946, he took advantage of an opening to teach the upper four grades in the two-room King City grade school. King City was where Bill had started school himself beginning in 1918, and where he had taught for two years (1930-32) after attending McPherson College. Bill had been elected to the King City school board, and worried about a potential conflict of interest in the hiring decision, but that did not turn out to be a problem. With his master's degree in education, he was the most over-qualified elementary school teacher in McPherson County. But he was delighted with the teaching job and threw himself into it wholeheartedly. In later years, when Meta was asked if Bill was concerned that he was "wasting his history degree," she said, "Oh, no! He said, 'this is the arena! You are preparing young kids for life. This is more important than high school!'" front row, fourth from left. 1945-46. Bill taught grades five to eight at King City for two years (1946-1948). Then he took another elementary school position for two years (1948-50) and taught all grades at the Pleasant Ridge one-room elementary school, located seven miles of unimproved dirt road south of the farm. His salary at Pleasant Ridge was $250 per month, a significant addition to income from the farm. The school year was seven months, September to April. At King City Bill had thirteen students in his classroom, a much more manageable number than the forty students with one teacher when he had started in the first grade in 1918. 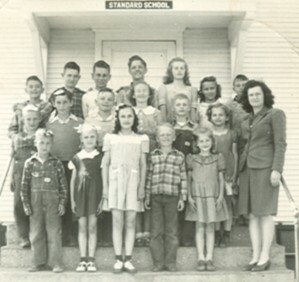 Teaching the lower grades in 1944-46--including Jimmy Juhnke in the third and fourth grades--was Bill's brother-in-law, Reuben Krehbiel, husband of Meta's sister, Lora. Although it was a public school, all of the students were from Mennonite homes. King City was not much different from a parochial Christian school. Opening school exercises included the singing of Christian songs. At Thanksgiving the seventh and eighth grade assembly performed "The Story of the Pilgrims." On December 23, 1948 they produced a public Christmas pageant, "Following the Star," which ended with a cr�che scene including the holy family, shepherds, and wise men. In front of the school was a flagpole where Bill or Reuben raised the American flag every morning. Behind the school were boys' and girls' outdoor toilets. There was, of course, no gymnasium, although the basement was large enough for a ping pong table. A major improvement of athletic facilities was the installation of an outdoor basketball goal. 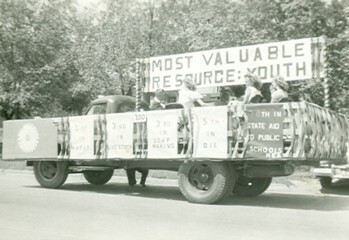 King City Grade School float in the McPherson May Day parade, 1948. Won first prize of $50. King City students had the opportunity to take instrumental music lessons from Mr. Fritjoff Mark, who drove out every Thursday from McPherson. The young musicians performed at the county music festival and got ratings from "good" to "highly superior." Bill's students remembered him as an inspiring teacher. Galen Stucky, who went on to a distinguished career as a chemist at the University of California, Santa Barbara, said that Bill was "the best teacher I ever had." To foster interest in national public policy and peace issues, Bill had his students write "air mail letters on military training" to representative Ed Rees in Washington D.C. For "manual training" Bill had the students make two picnic tables for the "Juhnke grove." The entire school made a field trip to Hutchinson to visit the salt mine, paper mill, fire station, and reformatory. The big sports activities were softball and basketball. The 1947-48 illustrated school annual, for which Bill took pictures with his old box camera, reported that King City won six and lost four softball games against other schools. One page in the school annual reported detailed statistics, including the batting average of each player. Jimmy Juhnke's (4th grade) average was .385. King City Grade School softball players. 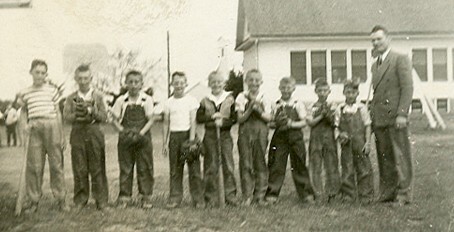 Jim in middle holding the bat. Teacher, Reuben Krehbiel. Spring 1948. Last updated 4 August 2009.